Astronomers discovered dust around an unusual class of interacting binary stars, a highly magnetic white dwarf star that is Earth-sized but weighs about 60 percent of the mass of the Sun and a cool object similar to a brown dwarf that is Jupiter-sized but has about 40-50 times the mass of Jupiter. Astronomers using data from NASA’s Wide-field Infrared Survey Explorer, or WISE, have discovered dust in an unusual place–just outside the reach of a binary star system with a short 3-hour orbit. The binary consists of a white dwarf with a red dwarf companion separated by a distance slightly larger than the radius of the Sun; an extremely small stellar orbit by astronomical standards. The system is known as a “post-common envelope” binary because at some point in the past, one of the stars had expanded so much that its envelope of material engulfed the other star. This short-lived (months to years) phase is known as a “common envelope”. 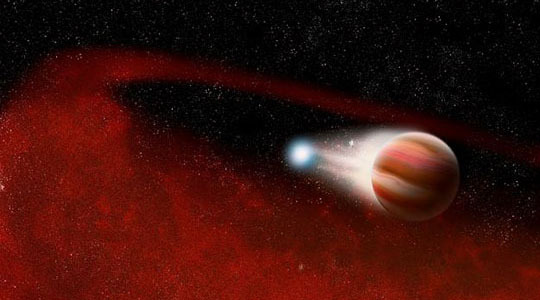 It’s believed that the binary originally consisted of a star like the Sun and a red dwarf. When the Sun-like star reached the end of its life, it swelled into a huge red giant, eventually encompassing the companion red dwarf in material from its outer atmosphere. During this process the red dwarf companion spiraled in closer to the giant’s dense stellar core. This inward spiral pumped energy into the giant’s envelope and hastened its demise by ejecting its outer layers of gas. The stellar core and the red dwarf survived this cataclysm as a very close binary, with the core slowly cooling into a white dwarf. The survey was conducted to look for dust and brown dwarfs around single white dwarfs, so it was particularly surprising to see the strong signal of light from dust around a white dwarf binary like SDSS J0303+0054. This is the first example of such a system. Based on the brightness of the binary in the infrared, WISE astronomers calculated the rough size of the disk to extend from a distance equivalent to two times the Sun’s radius out to just beyond the orbit of Venus in our Solar System. Astronomers also estimated that the amount of dust was equivalent to the mass of an asteroid a few tens of kilometers in radius, slightly smaller than the size of Los Angeles. Be the first to comment on "WISE Discovers Mystery Dust Around an Unusual Class of Interacting Binary Stars"